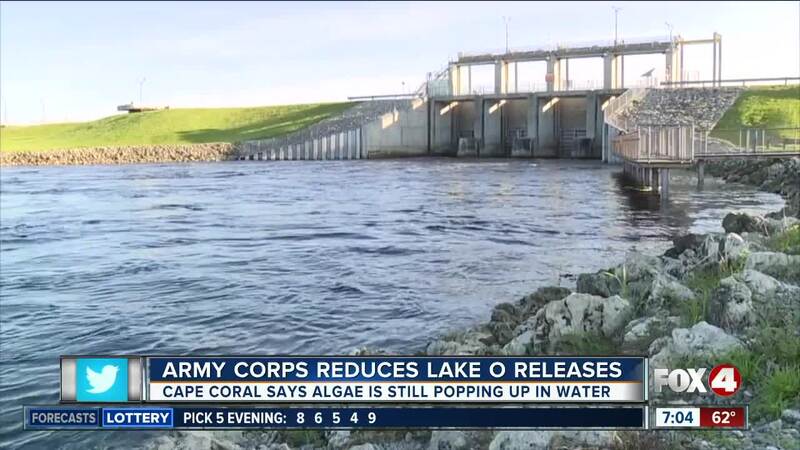 FORT MYERS, Fla. -- Over the weekend, the Army Corps of Engineers reduced releases from Lake Okeechobee into the Caloosahatchee river. Yet, in a recent memo from the city of Cape Coral, algae blooms have already been popping up in the water. The city manager sent out a water memo saying blue green algae was found near the Davis Boat Ramp nearly two weeks ago near Palm Beach Boulevard in Fort Myers. The city said about 20 micrograms of microcystin toxins were found. The memo did not say if that was a significant or harmful amount. Since the end of February, the Army Corps has been sending pulses of Lake O water into the Caloosahatchee river to drop the lake level before we hit the rainy season. At last check, the lake level is at 11.90 feet, which is about 2 feet lower than it was at this time last year. The city said they recognize the Army Corps needs to do this. However, they have their environmental resource division monitoring these releases right now. They said it’s bringing excessive nutrients into the estuary that may fuel more algae blooms. Cape Coral City Council will go over the water update in their regular meeting at 4:30 Monday afternoon. The public still has time to voice their opinion on Lake O releases to the Army Corps. Comments have to submitted by April 22.